At the May school board meeting, Mr. Smith was recognized as MCS's Secondary Teacher of the Year. 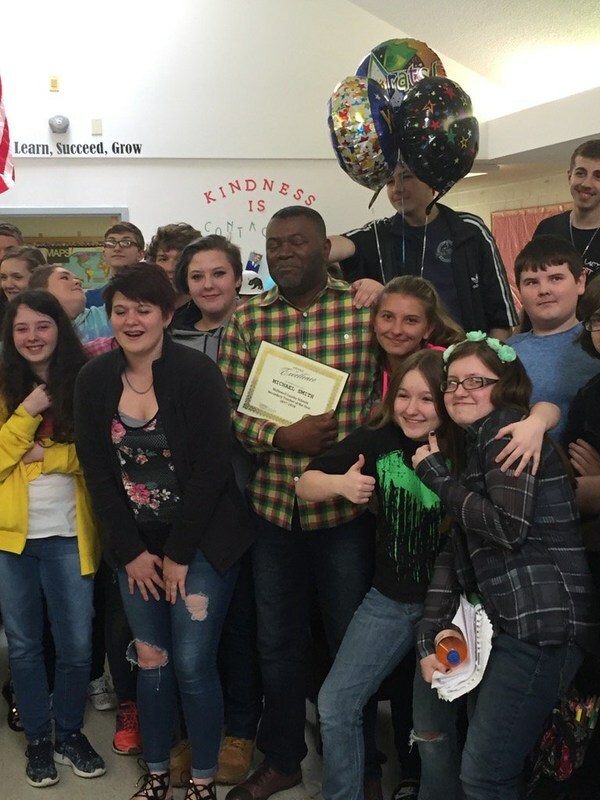 Congratulations Mr. Michael Smith, McDowell County Schools Secondary Teacher of the Year! At the Alternative Education Center, we envision a partnership between home, school, and the community where each is an active participant in the academic and emotional growth of students. We serve students in grades 8-12, with the majority of our population being high school students. We are a small school with an enrollment of 100 students. We are alternative to a traditional large school and we believe in an individualized approach to education. The climate is orderly, safe, and conducive to teaching and learning. A unique aspect of the Alternative Education Center is our small class size (1:15 teacher pupil ratio in all classes). The atmosphere fosters respect along with a spirit of understanding, tolerance, and friendship. The environment allows each individual to develop physically, mentally, morally, and socially. We believe there are no limits to learning. We have high expectations and truly believe that the dignity and worth of the individual demands quality and equity. We envision learners who can come to see education as increasing their own choices, building bridges to new opportunities, and improving the quality of their lives. With the help of parents and a concerned public, we are proud to accept the responsibility of helping all of our students recognize their potential. All juniors will be taking the ACT Thursday 3/1/2018. The test will start first thing in the morning. Please be on time. If you have any questions, do not hesitate to call the AEC (652-1040). Check out our current newsletter. Students and staff worked hard to create a newsletter that showcases the AEC. Our students have worked hard to create a newsletter that showcases their writing skills while also giving an accurate picture of what happened quarter 1 at the AEC. First period starts at 8:15. If your student comes to school late, when they arrive they will have to sit with the principal or the BOOST coordinator. While they are with the principal or the BOOST coordinator, they will need to develop a plan to ensure they are in class on time. We need our students to be in their classes, on-time! If you have any questions about our tardy policy, please do not hesitate to contact us. We are here to support your student and ensure they graduate from high school prepared for the world of work. Mr. Smith, one of the AEC's social studies teachers, has been awarded McDowell County Schools Secondary Teacher of the Year. There are times when there simply are no words. There’s just nothing you can do or say to capture what you are experiencing. It’s not a feeling - it’s much deeper than that. But it’s an awareness for which there is no available expression. That’s where I am right now, and yet fully understanding that SOMETHING, in the way of a response, must be done. I just received an honor that so many others could have received, and it would have been good and right. While I’m grateful for it, my gratitude is overshadowed by a humility that any honest person would surely have in the receiving of such a thing. Honor is a bestowment. It is something less earned, and more granted. You acknowledge you were chosen from a company of others who could have more justly been chosen. Grace always takes away boasting. On behalf of the Alternative Education Center, I’m grateful for the privilege to work with such a great collection of educators, staff and students. This is a remarkable place. I will do my best to let the McDowell County Secondary Teacher of the Year honor serve as a job description, as I do my part on this team. That’s what we are here; a team. To you Ms. Widmann, thanks for your guidance and your expectations for all your teachers. We need high standards. Students, I appreciate, your kind words, gestures and notes. I honestly don’t feel that I have worked a day since April of 2004 when I started here as director of Community Short Term Opportunity Program (C-STOP). And I would be remiss if I failed to mention two guys who are no longer at our school, but both instrumental in my decision to get certified - Brian McKinney (literally taxied me to the RALC in Catawba) and Zack McCartha. It was the right choice.